« DEFRA’s Joint lack of ‘Action’ A failure to bring the root cause of Hen Harrier killing to an end first. For thousands of years the Golden Eagle has survived against all the odds, finding safe refuge in one of Scotland’s most rugged and beautiful landscapes in the Western Highlands of Argyll. Here amongst the isolated glens of Glen Coe’s peaceful Blackmount Forest as many as 8 pairs of Golden Eagles have continued to raise their families unmolested, despite all that our modern society continues to thrown at them. The Blackmount and Glen Coe regions are so mountainous that they are totally unsuitable for shooting driven grouse; as a result, for over two hundred years, estates in these regions have had to focus their commercial sporting interests almost entirely on deer stalking. As the Golden Eagle is not regarded as a major threat to the Red Deer in the two regions, Golden Eagles have remained comparatively free from human persecution. The situation is very different for the Golden Eagles which nest in the Central, Northern and in the Eastern Highlands of Scotland. In these areas driven grouse shooting is far more commercially viable and, even in the twenty-first Century Golden Eagles continue to be heavily persecuted upon most of these Highland Red Grouse moors. 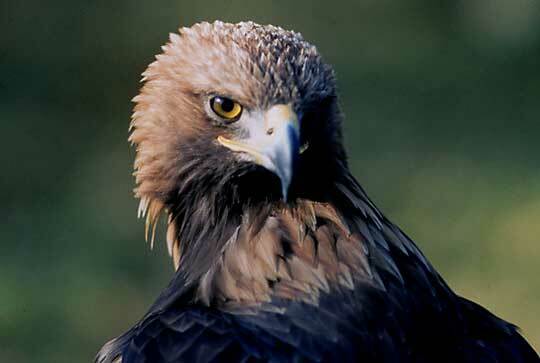 Figures produced by the RSPB conclude that since 1989, at least 50 Golden Eagles had been shot or poisoned in Scotland. Many regard this figure as just the tip of a much deeper iceberg bringing shame on Scotland’s reputation. One raptor expert who wishes to remain anonymous recently admitted he believed the situation in Scotland resulting from poisoning and shooting of raptors would never be resolved and populations would never recover. In an article published by Raptor Politics, John Graham claimed “climate change would not kill raptors but the Government’s policies would .” Whether John’s claims are valid or not, climate change in the Highlands of Scotland is certainly taking place. These important changes are causing problems for many of Scotland’s upland birds, including Golden Eagle, Hen Harrier, Peregrine, Short-Eared Owl, Merlin, Red Grouse, Ptarmigan and Dotterel to name but a few. Climatic changes taking place throughout the Highlands today are certainly having an adverse effect on the biodiversity within many upland ecosystems such as the Blackmount and Glen Coe regions. Here the Red Grouse, Ptarmigan and Mountain Hare are all in decline due to the combined effects of colder and much wetter seasonal changes, habitat erosion and heather loss due to years of overgrazing by sheep and deer. Throughout the Western Highlands in the springs of both 2010 and 2011, when above average temperatures were followed by a much cooler period with rain almost every day for weeks on end, the breeding cycle of many upland birds was adversely affected. In 2010 the cooler and wet climate lasted well into the autumn when conditions resembled the beginning of Scotland’s winter months of October and November. The precocial chicks of game birds and waders, which leave their nests after they hatch and forage on their own, are particularly vulnerable to such wet and cold conditions. For the birds that manage to survive such extreme weather patterns, they then have to contend with the parasitic tick which is passed on from Mountain Hares, sheep or Red Deer. 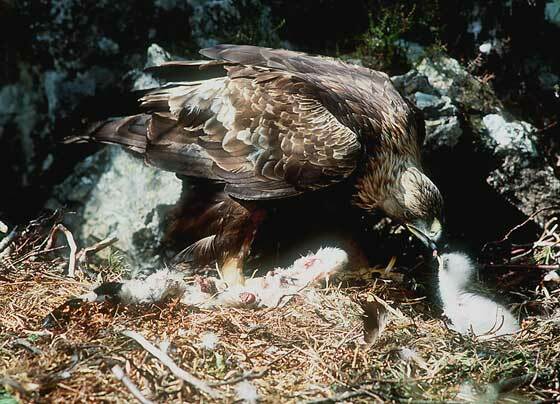 In 2011 in the Glen Coe region the number of Golden Eagle eyries containing twins was much lower than normal compared to seasons past. 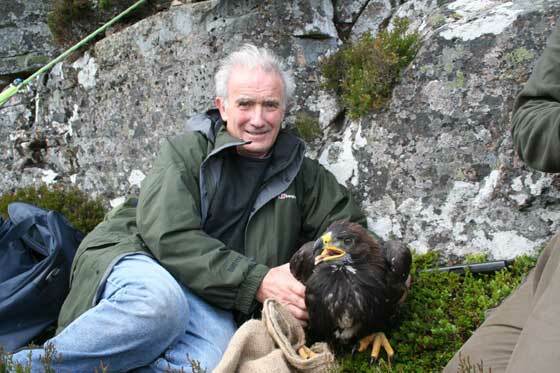 Of the four ancestral Golden Eagle territories I visited when ringing eaglets in this region of Argyll only two eyries contained chicks at all. 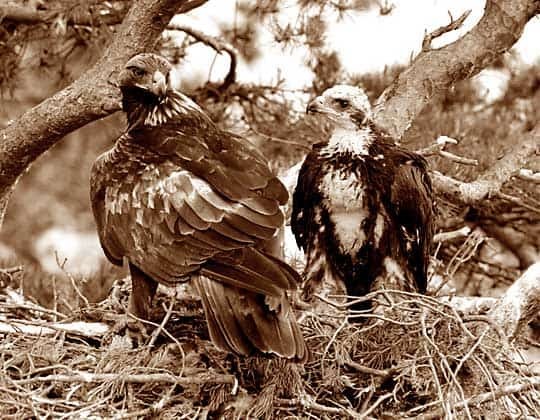 The first eyrie examined on the 24th June contained a brood of twins, which surprisingly were only four weeks old and still in white down, while a second eyrie examined on the following day contained a single well feathered male eaglet almost ready to fledge. 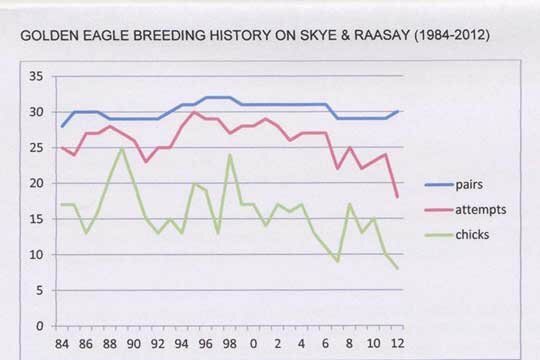 2012 continued the downward trend of recent years with the poorest breeding season for Skye’s Golden Eagles since 1984. Only 8 young have fledged from 7 successful nests. When visiting a third eagle territory which had existed in one of Glencoe’s more remote glens for countless decades, I was disappointed to discover an estate shooting track had recently been constructed passing just a few hundred metres in front of the eagle’s ancestral nesting cliff at the head of this remote glen. Looking across the burn separating the track from the cliff face the remains of several old and abandoned eyries were clearly visible. Each of the huge stick constructions had been built at various intervals across the rock face which towered 50 metres above the despoiled nesting glen. In my opinion Golden Eagles are unlikely to return to this ancestral nesting territory because of the track’s disturbing encroachment within such a secluded location. I find it curious that in Scotland estates are not obliged to consult with any statutory authorities before building such tracks across their properties; even where such installations can result in the foreseen disturbance of nesting Golden Eagles. Sadly in the highlands this is a trend repeating itself upon countless additional sporting estates. These invasive roads are now causing irreparable damage to the biodiversity within these regions due to the destruction of important wildlife habitats, upon which in particular, the golden eagle and other rare or uncommon forms of flora and fauna are dependent. 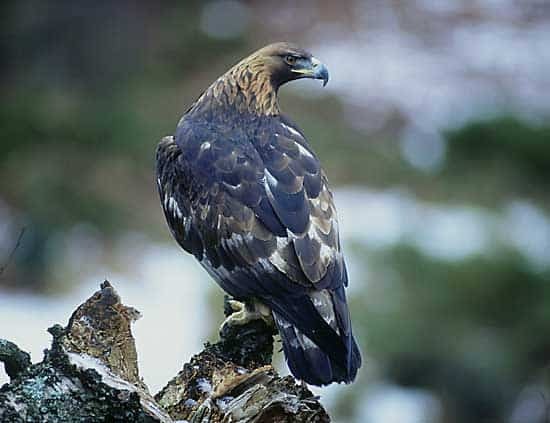 On 28 October 2010, following the consultation on 6 new Golden Eagle Special Protection Areas (SPA’s) which took place from 13 January 2010 – 7 April 2010, Scottish Natural Heritage announced that all 6 additional SPA’s were formally classified by Scottish Ministers adding to the 8 SPA’s which already exist in Scotland. Taking the combined totals of 141 Golden Eagle territories that existed in 2003, each of which are now located within the fourteen designated Scottish Golden Eagle SPA’s, of the 440 estimated totals of Golden Eagle territories in Scotland, just 32% of these territories are currently protected by the recent Golden Eagle SPA classification. This means as many as 299 Golden Eagle territories (68%) remain outside the Scottish Golden Eagle SPA’s altogether. Cairngorm Massif – 26 active territories in 2003, representing approx 5.8% of the GB population. Foinaven – 6 active territories in 2003, representing more than 1.4% of the GB population. Glen Affricto Strathconon – 10 active territories in 2003, 2.2% of the GB population. Glen Etive& Glen Fyne –19 active territories in 2003, more than 4.2% of the GB population. Jura, Scarba& the Garvellachs – 9 active territories, more than 2.0% of the GB population. Moidart& Ardgour –11 active territories, representing more than 2.4% of the GB population. Cairngorms – 12 active territories in 2003, representing 3 % of the GB population. Caithness & Sutherland Peatlands – 5 active territories in 2003, representing 1 % of the GB population. 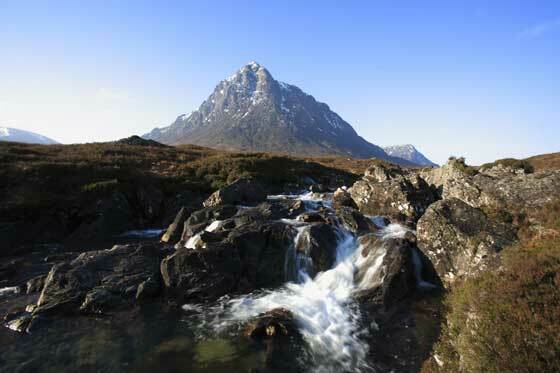 CnuicagusCladachMhuile (MullCoast & Hills) Cuillins on Skye – 9 active territories in 2003, representing 2 % of the GB population. Lewis Peatlands – 6 active territories in 2003, representing 2 % of the GB population. North Harris Mountains – 7 active territories in 2003, representing 2 % of the GB population. The Isle of Rum – 4 active territories in 2003, representing 1 % of the GB population. *Cullins – 11 active territories in 2003, representing 3 % of the GB population. *Site boundaries still to be determined and thus details may change. On the 15 July 2011 Scottish Ministers finally rejected the wind farm development proposed on land at Stacain, near Inverary. Scottish Ministers concluded that, having taken all relevant considerations into account when reaching their decision, they were unable to ascertain that the proposed development would not adversely affect the integrity of the Glen Fyneand Glen Etive Special Protection Areas set aside for the long-term protection for Golden Eagles in Scotland. The decision taken by Scottish Ministers represents an important milestone for the future safety and security of Golden Eagles in parts of Scotland. The fourteen Golden Eagle SPA sanctuaries which have now been established should in the future make it more difficult, if not impossible, for wind farms developers to locate these installations upon or close to current SPA’s like Glen Fyneor Glen Etive. In the future wind farm objectors would stand a much better chance of preventing the location of wind farm developments close to or within SPA’s using the argument for rejecting the proposed development at Stacain. There is however a black cloud over wind farm developments in Scotland caused by issues few estates or developers would wish to discuss openly. Money and lots of it is one of the best motivators I can think of for getting rid of a few hundred troublesome ‘protected’ birds of prey which are standing in the way of an estate making millions of pounds from a wind farm development. There will be very few estates that will stop to consider for one moment the potential penalties for their illegal actions, especially when they already know the chances of being caught and convicted are slim, and the penalties if they do are inadequate and offer little deterrent. Taken as a whole, the creation of the new Golden Eagle SPA’s in Scotland is a step in the right direction and should have a lasting and positive impact on the population of Golden Eagles within each of these important regions in the years to come. However this should be viewed with some caution as the classification of SPA habitats, or for that matter as an SSS’i does not necessarily guarantee and end to persecution or breeding successes of raptors like the Golden Eagle within these specially protected areas. A prime example has been the almost complete disappearance of the Hen Harrier throughout the northern uplands of England the result of sustained persecution. In 2011 Peregrines in the Forest of Bowland fared not much better, with fourteen territories failing to produce any young at all, a 74% failure rate. In 2016 only a single nest was productive, with as many as seventeen peregrine territories recorded as abandoned. This was despite the region’s SPA and SSSi habitat classification within this moorland region of Lancashire. Central Government even allowed the building of a large wind farm over-looking the Lune Valley at Caton Moor located 6km inside the Forest of Bowland’s AONB and close to the SPA and SSSI, after the local Council rejected the application. It is I feel significant to read what the Conservative party had to say before coming to power in 2007 about the proliferation of wind farms and the damage they are causing to birds of prey. “The rapid spread of wind farms in Britain – encouraged by Government subsidies (Labour) for renewable energy projects – poses a grave threat to birds of prey.” This statement just underlines the hypocrisy of members of the current Westminster government, in particular many of its leaders, once they were elected to Government. Recently farmers in Ireland, who supported a wind farm development in one location, stated they regard the Hen Harrier as a hindrance. They also claimed they would shoot all Hen Harriers they found if the wind farm project they supported was brought to a halt by the anti wind farm protestors. Wind farm planning decisions are always going to result in polarised and contentious opinion no matter which side of the argument you support. However bad planning decisions where the interests of rare and threatened wildlife resources are suspiciously over-looked is inexcusable. Sigrid Rausin who owns the Coignafearn estate in Scotland’s Monadhliath mountains claimed in 2010 the £100 million, 33-turbine project on the neighbouring Dunmaglass estate, which was subsequently approved by Scottish ministers despite widespread opposition, would not only spoil one of Scotland’s wildest landscapes, the project poses a physical threat to raptors like the Golden Eagle and should not therefore have been approved. This important area is regarded by conservationists and ecologists like Roy Dennis as potentially one of the best wilderness areas for Golden Eagles in Britain. The two images are of Alma, the top image shows Roy Dennis ringing Alma as a nestling, the second show Alma a few months later found poisoned . Despite this Ms Rausin claims “the Dunmaglass approval shows that where a species like the Golden Eagle have been hunted to near-extinction, protection, sadly, is irrelevant in the planning process.” She appealed to Scottish Natural Heritage, the environment agency, for Special Protection Area (SPA) status for Golden Eagles in the Monadhliaths, and believes that the failure to designate the area is damaging conservation in Scotland. 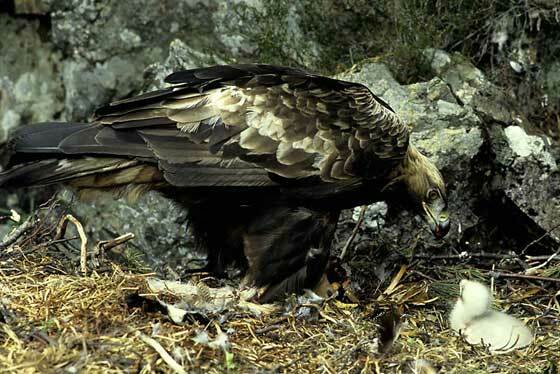 This was the second Golden Eagle found poisoned in Scotland in 2009. This two year old bird was found on the slopes of Beinn Udlaidh in Glen Orchy on the Auch estate Nr. Glen Coe on 7 June 2009. Ms Rausing claims that she had been informed by her ecologist he had observed two young satellite-tagged Golden Eagles on the site of the new wind farm at Dunmaglass. In an interview with the Telegraph Ms Rausing several years ago maintained many owners of sporting estates in Scotland took the view that they own the land, and no one has a right to interfere. She has also accused other Scottish lairds and their gamekeepers of killing Golden Eagles because they believe it is a “victimless crime”. Alan Macintyre, project manager for the Dunmaglass wind farm, said “the development was in an area that had no environmental designation, there were no breeding eagles on the estate and there had been no known collisions between Golden Eagles and wind turbines in the UK”. The question which should be asked; how long can Golden Eagles in other regions of Scotland hang on in the face of such invasive human commercial development on top of all the additional pressures they are currently facing? In July 2011 the Farr and Kyllachy Estate, near Inverness was raided by a number of police officers from the Northern Constabulary. The raid was in connection with alleged wildlife crime incidents that include a poisoned White-tailed Eagle and a poisoned Golden Eagle, believed to have been discovered in June 2010, and four dead Red Kites. According to a 2005 report in The Times, Farr Estate is expected to receive profit of up to £11 million from revenue generated by the 40 wind turbines which are already operational on the estate. An additional 20 turbines were planned for installation on the Kyllachyand Farr estate Nr. Tomatin. The latest news is RWE npower renewables has requested a scoping option for this 20-turbine development. 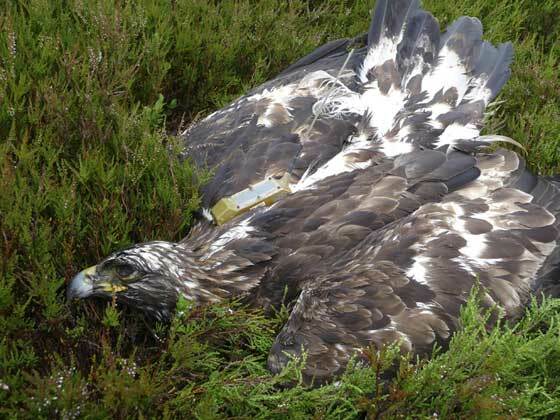 Since January 2010, many additional protected raptors have been found dead in other regions of Scotland, many had been poisoned. It will be interesting to establish if a correlation exists between the large numbers of iconic raptors found dead on Scottish shooting estates and those locations where wind farms are being proposed and developed like the Kyllachy and Farr estate. What chance do protected raptors have in the face of such intrusive developments and persecution backed by money, greed and power?